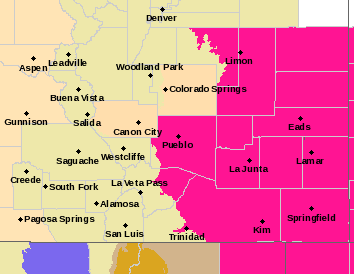 The National Weather Service has issued a red flag warning that covers all or parts of 13 southeast Colorado counties. The warning will be in effect from noon until 8:00 p.m. due to west winds expected to gust up to 45 miles per hour, humidity sinking as low as seven percent, and the generally dry conditions in the drought-plagued area. 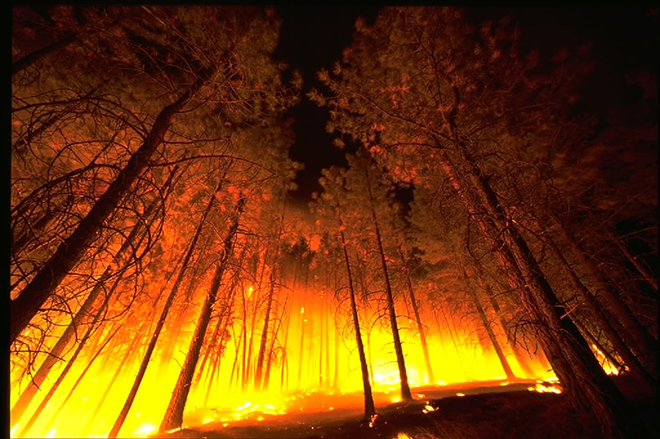 A fire that started last week in New Mexico has burned thousands of acres inside of Colorado in Las Animas and Baca counties, and continues to be fought by crews in three states. All of Baca, Prowers, Bent, Otero, Crowley, Kiowa, Cheyenne, Kit Carson and Lincoln counties are impacted by the warning, along with large portions of Las Animas, Huerfano, Pueblo and Elbert counties. Neighboring counties in Kanas, Oklahoma and New Mexico are also under a warning. The risk for fire continues Friday throughout the area, and a fire weather watch has been issued for Friday morning through the early evening hours.